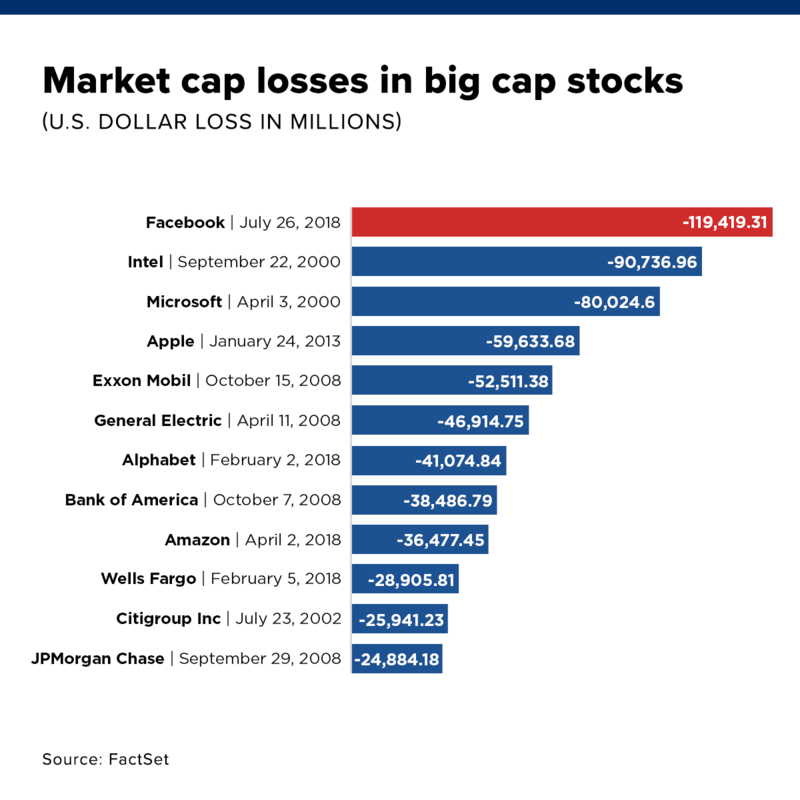 You lost almost $150 billion for Facebook. If you know the value of privacy, care about what happens to your data and the legality of the companies you support, if you own a business that relies on social platforms or is adjacent to them, you’re probably responsible for what happened in the past 48 hours at Facebook. If you read this blog and followed our protection guides, then you’re probably doubly aware of your responsibility. What are you responsible for? For turning the tide. On Thursday, the social media giant released its quarterly earnings report and, while the numbers did not look scary on the surface, the market was actually hit by a tsunami. After the Cambridge Analytica breach, the General Data Protection Regulation (GDPR) put in place earlier this year, Facebook’s rise finally stopped and even reversed, just like the tide. With the report out, shares price fell down by 19%. In actual money, that dip translates to between $120 to $150 billion lost in Facebook’s market cap. As CNBC pointed out, no company in U.S. history managed to actually lose more than $100 billion in just one day. Intel came close, at the end of the dot-com bubble that was essentially a reset button for the whole of the Internet. In third place is Microsoft, whose stock went down 14%, or around $80 billion, on April 3rd, 2000. Why? A judge’s hammer came down and decided that Microsoft Corp. violated antitrust laws and used its power to stifle competition. Is it not a coincidence that two out of the three biggest market earthquakes happened because a tech giant was walking at the edge of the law, trying to find a way to use it to drown competition while also undermining the landscape in which it was established. Facebook does not want to provide a good experience to you, inasmuch as it wants to sell you things. It wants to keep you engaged, not happy, on its platform, in order to turn around and sell your attention to the highest bidder. 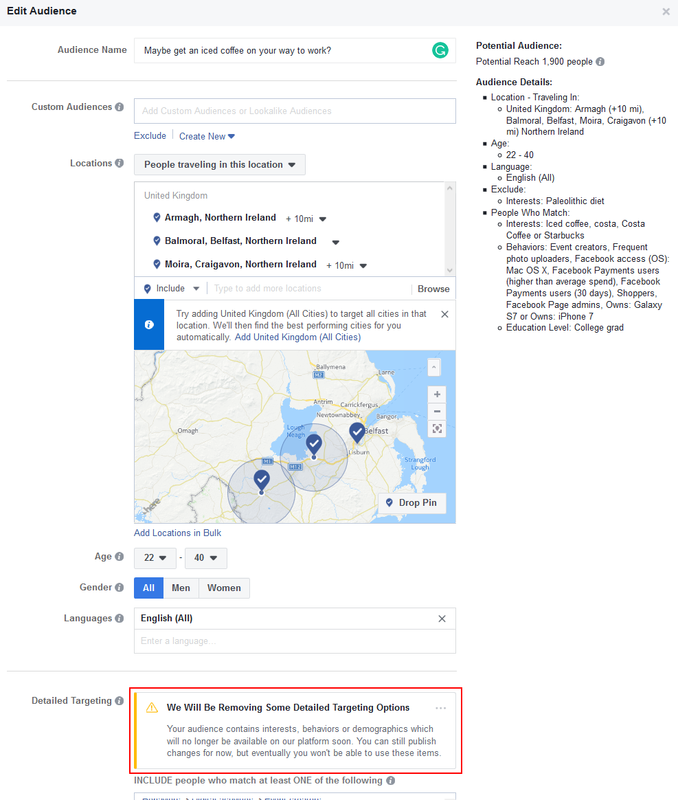 Facebook Ads Manager, even with no previous experience of the platform, lets you play around like this. These settings are what is available now to advertisers, though you should know they were even more granular before the Cambridge Analytica incident, Facebook’s own Watergate. As you can see in the screenshot above, there is a notice that a lot of these options will no longer be available in the near future. The poker-faced reason for why these ad targeting settings exist is that users freely share their personal info with Facebook and other social media giants. It’s meaningless little streams of information for the individual, which can indeed provide much better ads, but for Facebook and other giants is the actual revenue stream and the temptation to bend the rules. As recent events revealed, the companies holding that data themselves are vulnerable to speculators like Cambridge Analytica. You see, the online advertising ecosystem thrives under very specific conditions: it has to know exactly what Facebook users are doing and thinking at the moment so that they can serve up the best ad. And Facebook does have a history of questionable privacy practices and security incidents. It’s easy to cast blame on one company alone but it would be unfairly singling them out since the practices of handling large amounts of data have not always fallen into the “fair” category and have always carried the “risky” label. Google was slammed with a $2.8 billion fine for antitrust violations this summer, for almost the same tricks that brought the hammer down on Microsoft almost 2 decades ago. “Today, mobile internet makes up more than half of global internet traffic. It has changed the lives of millions of Europeans. Our case is about three types of restrictions that Google has imposed on Android device manufacturers and network operators to ensure that traffic on Android devices goes to the Google search engine. In this way, Google has used Android as a vehicle to cement the dominance of its search engine. These practices have denied rivals the chance to innovate and compete on the merits. They have denied European consumers the benefits of effective competition in the important mobile sphere. This is illegal under EU antitrust rules,” said Commissioner Margrethe Vestager. Coming back to the past few months and the events of the last 48 hours, Facebook lost the trial in the public court and now it’s losing ground with investors too. For privacy and security-oriented individuals, this is good news, though it doesn’t come from a good place. You could agree fully with the statement and sentiment. You could sigh and say “capitalism”. However, we’re here to look at it from the perspective of privacy and security. In this context, it’s a signal to you is that you have to be even more vigilant than usual. “Looking ahead, we will continue to invest heavily in security and privacy because we have a responsibility to keep people safe,” he said. It sounds nice but we are sure you know better by now. You need to invest in your own security and privacy because your and your business’s valuable data should not be at the mercy of giants. If you’re a home user, use one of our privacy guides to start protecting your digital life, they’re quite easy to follow and will ensure that you’re safe not just from cybercriminals, but also from those companies that sit at the edge of the law. If you’re approaching this from an organization’s perspective, reach out to us for the best tools to protect your and your customers’ interests. For a healthy digital economy in which all parties are satisfied, security and compliance are essential. Disclosure: This post probably ended up after we spent a very small sum to buy advertising space on a social platform. The only criteria we used to “target” you was the fact you speak English and value both privacy and security. We know that’s what you also look for when you come to us for cybersecurity expertise. Thank you so much to this web p[ost. This is too good and interesting. I am thankful to you for sharing such important suggestions. I love to read your post. if you have more information like these keep sharing. Nice Post! I appreciate your Post, valuable photography Blogs. This list is really helpful. Thanks for posting. I love your photography. Images look really beautiful.